News that long-standing Independent Cllr Gerry Ginty is not seeking re-election to Mayo Co Council has set a cat among the pigeons in the Ballina Municipal District political scene. Cllr Gerry Ginty is retiring from local politics after 45 years. Cllr Ginty (75) had revealed some months ago that he had been approached to run for Deputy Peadar Toibin’s newly established Aontú party in the upcoming local elections. At the time, the councillor said he had not yet decided whether he would be running for election but confirmed that if he did throw his hat into the ring again he would do so under the Aontú banner. Last week, however, it was announced that Aontú had selected Ballina-based Cathy Gaffney to contest the local elections next May and shortly afterwards Cllr Ginty confirmed to the Western People that he would be retiring from a political career that has spanned four decades. He said he had deliberated over the decision for a long time and described it as one of the most difficult ones he has ever had to make. “If the right candidate offering an alternative voice had not declared in the Ballina Municipal District then I would have felt that I had no option but to run but I am delighted to see a young female candidate, Cathy Gaffney, coming forward for Aontú in this area,” Cllr Ginty explained, adding that he was satisfied that Foxford native, Ms Gaffney, will continue to effectively highlight some of the issues he has prioritised over the years, including the need for social housing. Cllr Ginty was first elected to Ballina Urban District Council as a Sinn Féin candidate in 1974 and on three subsequent occasions as an Independent candidate. He put in an impressive performance in the general election of 1997 but failed to take a seat. Two years later, Cllr Ginty retired from public life but made a surprising comeback in 2009 to take a seat on both Ballina Town Council and Mayo Co Council. Ginty has held his county council seat in the intervening years but lost his dual mandate in 2014 with the abolition of the town council. He says he has no regrets whatsoever about his political career and is particularly proud of the fact that he has never shied away from difficult decisions. Cllr Ginty remarks on the fact that many young politicians aspire to change the world but says his time in politics has taught him that the most important thing is not to allow the world to change who you are. He admits that he will miss political life and says he will continue to be concerned for the future of Ballina which he believes has been badly impacted by the abolition of its town council. He is appealing to the local electorate to keep the town in mind when voting this May. “I would say to people to vote for their own candidate but after that to think of Ballina town,” he remarks. 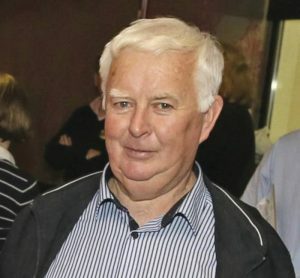 The departure from politics represents retirement in name only for Gerry as he has plenty of interests to keep him occupied, including his beloved North Mayo Horse Sanctuary, and he assures the Western People that he is happy to remain available in an advisory capacity to any councillors or individuals who are working with the interests of Ballina at heart.